At Orange County CyberKnife, we’re proud to offer world-class CyberKnife treatment to patients throughout the greater Orange County and Los Angeles areas. We treat a wide range of cancerous conditions, including brain cancer – which makes May a particularly special month for us. May is National Brain Cancer Awareness Month, and spreading awareness around brain cancer is a vital part of combating brain cancer. The brain is the body’s command center, and for this reason, brain tumors – even non-cancerous ones – can be devastating ailments. Whether malignant (cancerous) or benign (non-cancerous), brain tumors can press on important regions of the brain, causing a wide variety of symptoms affecting virtually any part of the body and ranging from minor tingling sensations to full-body strokes or death. But how common is brain cancer? Roughly 80,000 new cases of primary brain tumors are diagnosed each year. 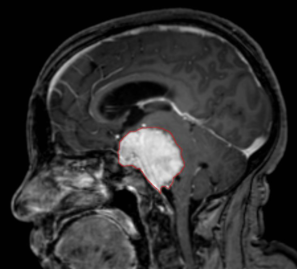 Primary brain tumors refer to tumors that form within the brain or central nervous system, whereas secondary or metastatic brain tumors travel to the brain from a cancerous tumor in another part of the body. Of these 80,000 cases, about a third are malignant. In all, there are about 700,000 people in the US living with a brain tumor. Scientists still don’t fully understand the causes of brain cancer, and while risk factors exist, they aren’t as pronounced as they are for many other forms of cancer. Primary brain tumors are more common in children and older adults, but it’s possible for someone to get a brain tumor at any age. Some brain tumors are linked to certain hereditary disorders, and scientists have found evidence of brain tumors being passed down through families without any relation to the known hereditary conditions. Other risk factors include exposure to certain chemicals, serious head trauma, prior history of seizures, and exposure to ionizing radiation. However, with all of these factors, the links are poorly understood. Scientists are actively working to learn more about the causes of brain cancer, which is part of why Brain Cancer Awareness Month is so important. We hope you’ll take the month of May as an opportunity to learn more about brain cancer, understand your own personal risk, and take steps to protect you and your family. If you or a loved one have been diagnosed with brain cancer, Orange County CyberKnife can help. We offer a wide range of convenient, effective treatments for brain cancer, including noninvasive CyberKnife. Contact us today to schedule a consultation, and have a safe, healthy Brain Cancer Awareness Month!